It's not often that a menu has credits for woodworkers, metal artists, and glass blowers, but the owners of Peso's are justifiably proud of this very attractive, French Quarter style restaurant next door. They also rattle off some of the stats: 712 panes of glass in the windows and doors, 85,000 Italian mosaic tiles in the floor, 40,000 glass tiles in the booth platforms, and 10,000 board feet of hardwood. (My favorite touch is the long, gently bending lamp hooks.) 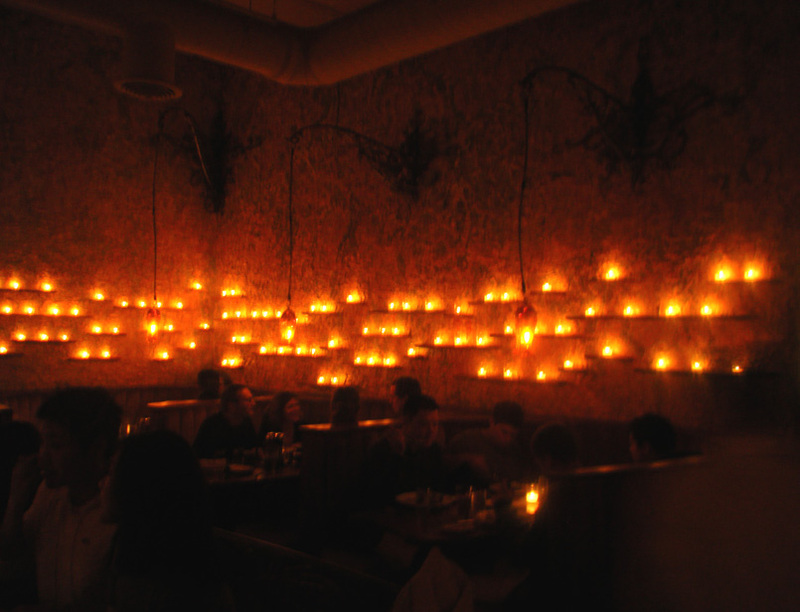 Other numbers I witnessed include about 200 wine choices, 40 vodkas, and around 120 votive candles sparkling on the walls. The menu is massive and comes with a large wine list and a very large menu of modestly discounted Happy Hour items (4:00-5:30 and 10pm-close). Both my food and my cocktails were very good. Toulouse staff include chef Eric Donnelly, from Sazerac and Oceanaire, and bartenders Shing Chen, from Ovio Bistro and Wild Ginger, and Miles Thomas, from Tavern Law. It is loud -- though not as loud as Peso's, and seems to play the same sort of rock music as Peso's, which seems a bit at odds with the romantic decor. 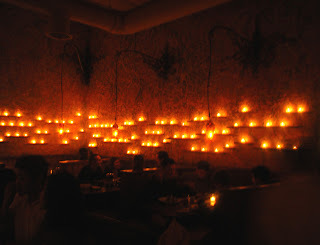 Overall it is a lovely place for dinner and/or drinks, particularly when it is dark outside.